The old saying that “music washes away from the soul, the dust of everyday life” (Auerbach) is so true. Today someone posted Curtis Mayfield and The Impressions’ People Get Ready on Facebook and as I listened to the song, I was deeply moved because of the plethora of social ills that are going on in society. There was a time when music lifted and inspired, and gave people hope, especially Black people. Songs like Say it Loud, I’m Black and I’m Proud (James Brown); Give More Power To The People (The Chi-Lites); Give The People What They Want (The O’Jays); My People…Hold On (Eddie Kendricks); Respect Yourself (The Staple Singers); To Be Young Gifted and Black (Nina Simone); and Love Train (The O’Jay’s) to name a few. These songs made it possible for Black people to keep on keeping on with pride, dignity and a hope that even despair could not quell. Yes, there was a time when music empowered people to empower a movement! We had pride, spirit, and unity, and it was that unity that ushered in change. In 2015, we are indeed living in the ‘Sign O The Times (Prince). With so much hate, murder, violence, poverty, crime, drugs destroying Black communities, inequality, racism, colorism, fighting, gangs, failed education systems, and murders of black people, we must do better to ensure a society that embraces all people of color, justice and equality. When I think of the plethora of ills in society, my heart aches and tears well up in my eyes because although we have come so far, we still have a long way to go. It seems that the journey is becoming more and more treacherous for Black people in this world. We are witnessing racism and people of color being treated disparately because of the color of their skin to such a degree, that the ills in society have become psychological, emotional, physical and social burdens that our children must bear. These burdens are becoming heavier with each passing day and if we do not take a stand now, our children’s hopes will be lost, their dreams deferred, and their aspirations stagnated. I know that so much more can be done if we, in unity, join forces to make a difference because there is power in numbers. As I write this post, I am filled with an array of emotions, thoughts and ideas. I believe that as Sam Cooke sang A Change Is Gonna Come that will lead all people of color to Higher Ground (Stevie Wonder). I believe that in unity, “we can make the world a better place for you, me and the entire human race” (Jackson and Richie, 1985) (We Are The World). We must realize that a “change will only come when we stand together as one” (Jackson and Richie, 1985). As Curtis Mayfield noted, People Get Ready because a train is coming! The Unity Train (Culbreth, 2015)! People getting on board will be those who embrace diversity, racial unity, peace, love, equality, and justice for ALL. The Unity Train will carry everyone to a destination where people from all ethnicities, races, religions, colors, national origins and sexual orientations, seriously committed to living and working together in unity to a society where they will have equal opportunity to reach higher ground and live fulfilling lives. A place where people will be able to say to themselves, What a Wonderful World (Armstrong). Race and color are not prerequisites for friendship, love, value or self-worth. “People get ready” because we are getting on board – the people who want to live together in peace, harmony, unity and embrace the diversity of all people! Are you ready to get on board? Better yet, lets unite and start The Unity Train, where people from all over the world can come together and work in unity for a better tomorrow. Where you come from, how you look, your race, age, religion, sexual orientation, gender, money, education color, or ethnicity are not important. What is important is that you are willing to get on board and be a part of the change needed in this world! Lets get this train going! Please contact me if you are interested in getting on board The Unity Train. 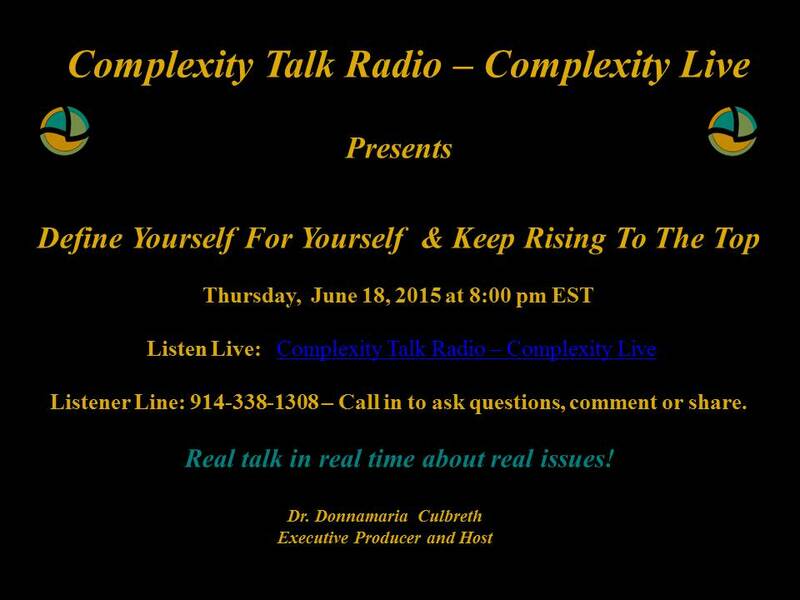 Join Dr. Culbreth for a commentary on why it is important to Define Yourself for Yourself! Straight to the point with no chaser! Host will interview new authors and discuss books. Host will discuss topics pertaining to men including relationships, race, colorism, relationships, crime, education, family, stereotypes, socioeconomic issues, global issues, the media and music industries, etc. Be able to think quickly to keep shows flowing (especially when interviewing guests). Present content in a confident manner as an expert in the field while on the air. Clear and distinct speaking voice and use of proper grammar.